At yesterday's Attain launch in Boston, Aetna and Apple heads broke down how the program will work and stressed transparency in data sharing. Dr. Alan Lotvin, EVP and chief technology officer of CVS, presenting at the Attain launch in Boston on January 29. It’s easy to ignore a flu shot reminder email or grab a donut on your way into work, but Attain — a new voluntary wellness rewards program developed in partnership by Apple and Aetna (recently acquired by CVS) — is aiming to curb these behaviors through personalization. 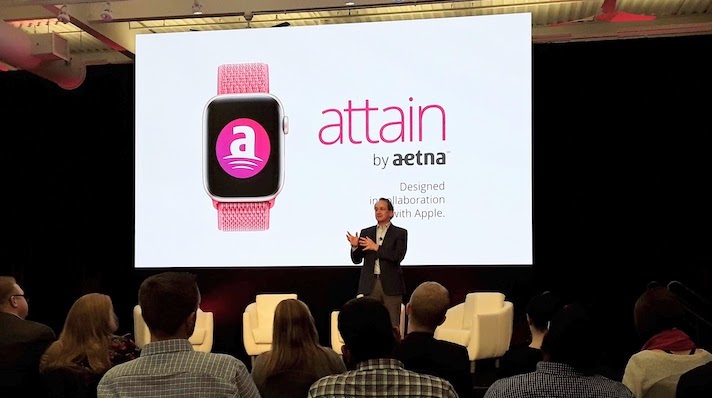 At yesterday’s Attain launch event in Boston, Apple and Aetna executives stressed the importance of both personalization and privacy when developing an incentive-based technology such as this. “Behaviors like activity or exercise are equally as important as your doctor, or your meds, in determining your long-term health. But we all know that behaviors are hard to stick, easy to break. We think that gentle nudge or a tap on the wrist at the right time may be what is required to keep you on track [for] healthy eating, selecting an activity,” Myoung Cha, head of health strategic initiatives at Apple, said at the event yesterday. “The truth is that today a lot of the efforts to encourage people to seek these preventative treatments, like flu shots or going to get a physical, are often not very effective. These messages sometimes get dismissed or are ignored. We think personalization or the lack thereof is what is missing here. … That’s what we are hoping to change with the use of data science, machine learning," he said. When a member signs up they will get healthy action notifications based on daily activity, or on information included in their Aetna health record. These could include reminders to meet activity goals, get a flu shot, refill a prescription or visit a primary care physician for a checkup, but may also come as a notification of low-cost options for lab tests or imaging. Over time, the program will further refine its recommendations based on the individual. Meeting these goals and challenges will earn rewards points that members can spend on gift cards, or redeem to offset the cost of the Apple Watch itself. For example, if a user has met all of their monthly goals, then Aetna will pay off their Apple Watch payment. “Most of the expense in healthcare is in chronic disease, and chronic disease is managed by individuals making small choices [and] small decisions every day, every couple of days, every week to improve their own health and the clinical, economical and personal burden,” Dr. Alan Lotvin, EVP and chief technology officer at CVS Health, said at the event. The project has been years in the making. The payer first started working with Apple in 2016 offering the smartwatches to Aetna members and employees. Lotvin said that this experience helped the companies figure out what worked and what didn’t. The technology was influenced in part by evidence from the health tech company Vitality, which has been involved with researching behavior change for years. “This personalization of the activity experience builds on tremendous experience from partners at Vitality, who for over a couple decades has been demonstrating that you can change behavior through activity, incentives and support in multiple countries around the world. We are thrilled to have them as partners,” Ben Wanamaker, head of consumer technology and services at Aetna, said at the event. But with so much personal information being entered into the program executives stressed the importance of data privacy. Users have the ability to opt out of sharing their data at any time. However, Cha also noted that by sharing data users can help improve the platform for everyone. Dr. Bud Tribble, the VP for software design at Apple, said that much like the privacy ensured by a doctor, the same expectations had to apply to the platform for it to work. He discussed Apple’s overarching “privacy by design” principal, which he said is built into the product — for instance, the new platform includes an onboarding experience that walks users through what is happening to their data and gives them choices, Tribble said. Both Tribble and Cha emphasized that no data is shared that directly identifies the person. The data will be used to support the program, and users can opt out of sharing their data whenever they liked. Privacy is a buzzword around Silicon Valley these days after several big tech giants including Facebook and Google have been in hot water over leaks. Despite the recent FaceTime bug, Apple has generally been vocal on its data security features for consumers. This privacy principle could be essential as it enters into the health space, and an essential one as the company takes its next step into the healthcare field. “We believe we are just beginning to see the impact we can make to improving health and are deeply inspired by the possibilities,” Apple CEO Tim Cook said during the company's earnings call yesterday.